Pressure cooking has come a long way since the days of intimidating pots with noisy, steaming gaskets sputtering away on the lid. Today’s pressure cookers are safer, quieter and more versatile than the vintage models of yesteryear. Braised Ribs in an hour? Yes, it’s possible with a pressure cooker! Pressure cooking is cooking food in a specialized sealed vessel with liquid. As the foods and liquid are heated inside the sealed pressure cooker, steam builds up and creates pressure inside the pot. Because the pot is closed, the temperature of the steam can rise (in an open pot steam never gets hotter than 212°F.) which, in turn, causes foods to cook more quickly. Pressure cookers range in size from 6-qt. to 8-qt. Our recommendation is one that’s on the larger side—you can’t cook large amounts of food in a small pot, but you can cook small amounts in a large pot. When buying a pressure cooker, pay attention to the thickness and width of the heavy metal plate at the base of the pot. Thicker plates will conduct heat better and more quickly, and help to maintain pressure inside the pot. This disk also makes the cooker heavier than a typical stovetop pot. Look for pressure cookers that have an easy-to-latch lid with gauges that are accessible and readable when the pot is at high pressure. Designs vary from manufacturer, but the best include pressure valves on top of the lid that pop out and are visible from several feet away. Season the beef with salt and pepper. Heat 1 Tbsp. oil in the pot of the pressure cooker over medium-high heat. 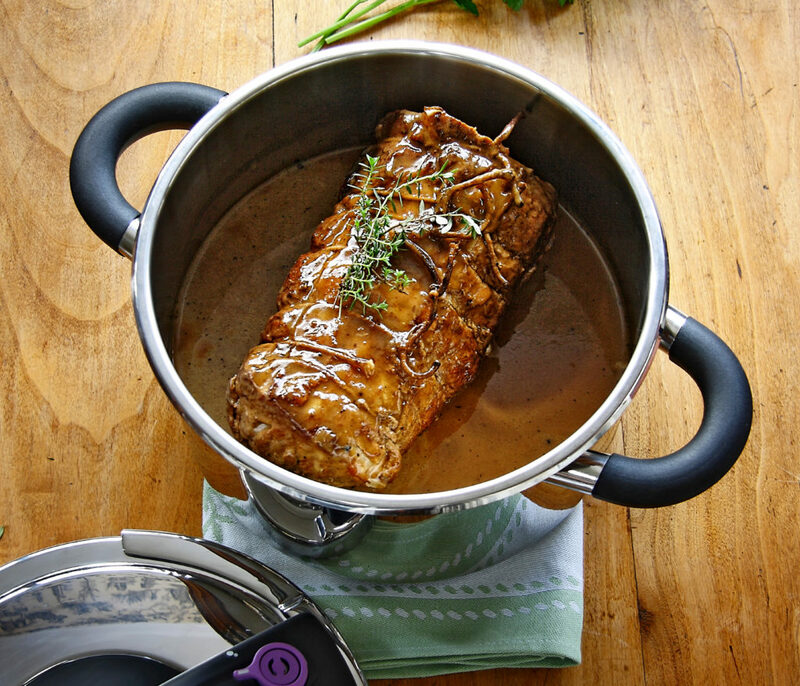 Add the roast and brown well on both sides – the metal disk on the bottom of the pressure cooker pot will heat quickly and will stay hot, so keep an eye on the roast to prevent scorching. Once the roast is brown, remove it from the pot. Bring the pot to high pressure over medium-high heat. When at high pressure, reduce the heat to medium or medium-low (stovetop burners vary in intensity) and cook for the time recommended in the recipe – a 3-lb. beef roast will require 45 to 55 min. of cooking. Begin timing once the pot reaches high pressure. Check the meat for doneness. If it requires more cooking, return the pot to the stove and let it simmer until it’s done to your liking. If the meat is cooked properly, carefully transfer it to a serving platter. Taste the sauce – if it seems watery in texture and flavor, reduce it over high heat to concentrate its flavors. If you’re new to pressure cooking you’ll undoubtedly run into some questions as you get accustomed to the appliance and the procedure. Here are some tips and troubleshooting techniques that may help. Familiarize yourself with all the parts and pieces of your pressure cooker by reading the manufacturer’s instructions before cooking anything. Be prepared to adjust your stove’s burners as needed in order to maintain the adequate temperature. All stoves and pressure cookers vary in their performance which will affect how each performs. Clean the cooker’s vents and valves well after each use – they can often become coated with cooking residue and affect the functionality of your cooker.